Includes the Virginia OSHA poster which reflects mandatory penalty amounts for each serious violation, non-serious violation, and daily penalty for failing to correct a violation. 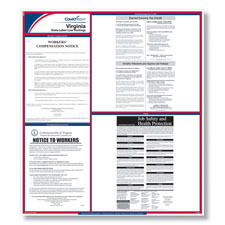 The ComplyRight Virginia Labor Law poster provides worry-free compliance for every location in a convenient all-in-one laminated design that makes meeting your state's posting regulations easy. The Virginia Earned Income Tax Credit poster has been updated to reflect the eligibility income limits for 2018. The Virginia OSHA poster has been updated to that certain employers who were previously exempt from the law are now subject to the penalty provisions of the Virginia Occupational Safety amd Health law. The Virginia Earned Income Tax Credit poster has been updated to reflect the eligibility income limits for 2017. 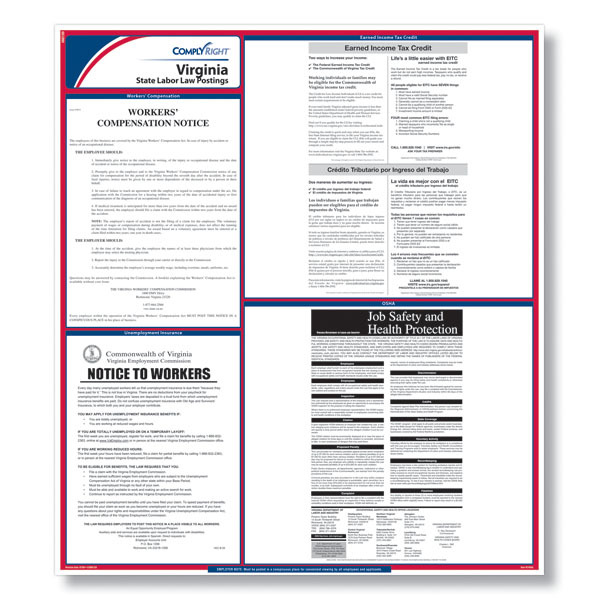 The Virginia OSHA poster has been updated to reflect the federal OSHA rule requiring employers to inform employees of their right to report work-related injuries and illnesses free from retaliation. The Virginia Earned Income Tax Credit poster has been updated to reflect the federal 2016 EITC income limits. The Virginia OSHA poster has been updated to reflect a clarification to the accident reporting requirements. Only fatalities must be reported within eight (8) hours. Poster size - 30" x 24"